Is it really possible for a twenty-first-century young woman to live a life in direct contrast to culture’s ever-changing standards? The answer is yes. 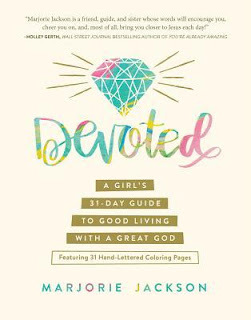 You're invited to join author Marjorie Jackson in Devoted, a 31-day devotional about letting love and dedication to Jesus penetrate every area of your life—relationships, decisions, standards, convictions, priorities. . .everything. 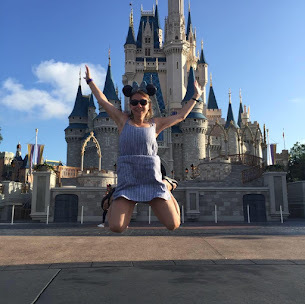 Whether you're a long-time Christian or the spiritual training wheels are still on, you'll dive into God’s Word and discover what it truly means to be a young woman who is completely, joyfully, beautifully different. . .while coming to understand that life is good with a God who is great. This is a super fun devotional because of the coloring pages. I love that it is a softbound and it smaller than novel that you can throw in your purse. It appeals to young readers, especially girls, but I think it is beautiful and I enjoy the devotionals. The devotional contains 31 days of readings that guides and encourages readers in their daily walk with Christ. The devotional pages are easy to understand and flow with questions, challenges and prayers. This is a fun, creative and awesome way for girls to go deeper in God's word! This is a great gift, especially for your girls in your youth group. I know several girls that this book is perfect for and I can't wait to gift it to them. Thank you to the publisher for providing me a complimentary copy. I give this devotional 5/5 stars. A favorable review was not required. I looked this one up on Amazon and I know my granddaughter would love this, so I put this in my shopping cart too. I have this!! I am so excited to check it out. I was thinking Alex would love this!